A bush dog at the Prague Zoo. Photo by Bonnie1978. The domesticated dogs that are found in Panama likely came in two major waves, one with the people who walked into the Americas over the Siberian-Alaskan land bridge that existed in the Ice Age and another that came on ships with the European conquest. Is some of South America’s pre-Columbian population of Pacific islander origin? If so they probably brought dogs with them as well, and those would possibly be of Australian origin. Figure that the genetic mainstream of domesticated dogs indigenous to the Western Hemisphere at the time of the European Conquest were descended from Asian and North American wolves, perhaps with and admixture of coyote ancestry. Probably those dogs that came with the Europeans were mostly descended from Eurasian wolves, perhaps with an admixture of African jackal ancestry. DNA studies could clarify this, were the cost of such studies to come down or grants to conduct them more available. Wolves and perhaps coyotes and jackals that were not themselves found on the isthmus are surely the closest wild relatives to Panama’s domesticated dogs. However, we have other wild canids here. The primarily North American coyotes (Canis latrans) and the primarily South American bush dogs (Speothos venaticus) also live in Panama. Had coyotes inhabited Panama in antiquity, then been absent for a time, only to relatively recently make their return? So far the fossil record does not tell us that, but for the Meso-American Isthmus farther north and west that does seem to have been the case. In legend, the coyotes of Mexico and Central America were sometimes seen as divine tricksters. Folk tales and fossils suggest that with expansions and contractions of agricultural frontiers, coyotes came and went. They do well on cleared land, in forest fragments and in urban and suburban areas. They are not particularly well suited as jungle animals. If catastrophe decimates a neotropical human civilization such that the forest takes back farms and pastures, does that drive the coyotes away? That may have happened in parts of Central America after the collapse of the Mayan civilization. There are parts of Panama that at the time of the conquest were well populated and cleared agricultural lands, but with the ravages of wars and diseases the Europeans brought to the isthmus the population shrank and in many formerly cultivated places the jungle grew back. Did that exile an existing Panamanian coyote population, as it apparently did in parts of Central America? So far we can only speculate. However, about in the 1970s the southern range of the coyotes began to extend from Mexico down into Central America and by the 1980s they were in Panama. It was thought that the Panama Canal was some sort of barrier, but by early 2013 there were coyote sightings in Chepo, east of Panama City and farther yet east of the canal. Now the speculation is whether they will penetrate or circumvent the forest barrier known as the Darien Gap, so as to get into Colombia and spread throughout South America. This writer has never photographed a coyote, but did see one from a bus traveling along the Pan-American Highway near the boundary of Chame and San Carlos districts in Panama Oeste. HEARING coyotes is a far more frequent event. At the foot of the foothills of Cocle province the occasional howling is unmistakable, and it tends to drive the local dogs nuts. As time goes by, will we see more dogs that are part coyote, or vice versa? As the two species can interbreed and both live around people, that will probably be the case. As agricultural pests the coyotes are probably overrated, but they will kill and eat barnyard fowl, cattle, goats and household pets. To the extent that rural Panamanians expect them to be predators of their livestock the coyotes are and will be treated as pests, which means that these rather intelligent wild canids will be reinforced in their natural shyness about interactions with humans. 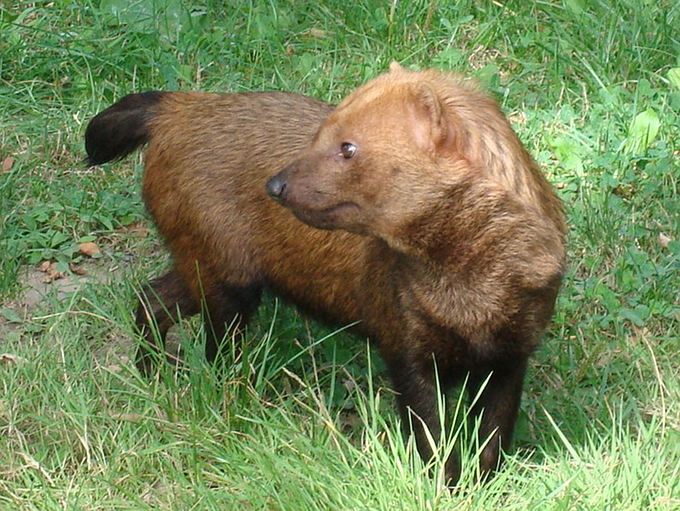 More elusive and but probably geographically more widespread in Panama are the bush dogs. These creatures have short legs, rounded ears and plump bodies, to the extent that they might appear to be tiny bears or relatives of the badgers rather than the dogs. They are canids, arguably related to the South American maned wolves or the African wild dogs. There have been a few sightings in Costa Rica, but Panama appears to be close to the northern end of their range. The bush dogs, which have partially webbed feet, will hunt in packs along jungle streams, with some pursuing their prey on land while other lay in wait in the water for dinner to try to get away by crossing to the other side of the stream. They avoid people and their domesticated animals, but recent camera trap studies have detected the bush dogs in a wide variety of ecological niches throughout the Panamanian isthmus.